Today I’ll take a closer look at the service and review all the information that is at my disposal. It is unknown who the developers of this service are, but support can be contacted via their contact form. There is no direct email address, and they promise a response within 24-48 hours, so not really a market leader in this category. 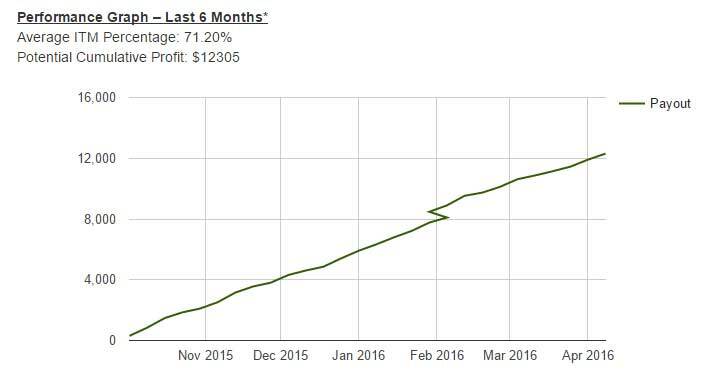 The Binary Options Pro Signals service has been available for a few years now and is promising to provide traders a 72.5% accuracy rate. This is a very impressive number, and it’s much more respectful than the developers that claim to have a win ratio over 90%. The traders that are providing the signals monitor 14 assets throughout the London and US market sessions. Obviously, if you don’t trade the London and US sessions, then the signals will be useless to you. For those that do, the team of traders send signals via SMS and email which makes it very easy to access them and place the trades. On the front page of the site we can see an example of their trade signals which shows the signal time, the asset, direction, the price and the expiry time you need to set. Basically, everything you need to see is being provided. As I read more on the Binary Options Pro Signals sales page I’m starting to see conflicting numbers. At the top of the web-page we see 72.5% but as I scroll down I see 88%, 81.4% and then 71.2%. When I’m looking into making an investment I hope to see consistency both in the numbers and in the message. I’m not sure why, but in this case the numbers are fluctuating dramatically depending on what paragraph you read on the sales page. Performance graph that needs updating. There is a unique performance graph that shows the last 6 months of trading with their signals. We are not given access to their actual signals list which is disappointing because I can’t verify the validity of this performance graph. Also, it looks like this webpage was last updated in April because they have no performance numbers for May or June so I would certainly email the developers to see if their service is still active before signing up. As I update this review for the first time in 2018, I can see that they did update their results. The winning percentage still remains at 71.20%, but they’ve included a new chart which shows that the system has earned over $40,000, as of January 1st, 2018. They are still 3 months behind, as it looks like they only update this chart every year or so, and I’m not overly impressed by the presentation either. There is really nothing about this chart, that suggests to me that this is legitimate. There are no trades provided, and it is a simple procedure to draw a line on a chart like this. I am certainly skeptical about the performance numbers being provided, even in the updated review. This is something the developers need to address. The reason for stating that the winning percentage of this service is unclear, is because they are all over the map when it comes to clarifying their claims. The majority of the review is focused around this element, but for good reason.We obviously want product developers to be transparent and clear. This is lacking at this point in time, but hopefully it’s something that’s resolved shortly. The people behind the Binary Options Pro Signals service believe that their signals are not just for traders but for anyone who wants to make real money. Yet, from what I’ve gathered in my research so far I can’t give a full recommendation. There are elements that I like about the service, such as the delivery method of signals but I would like to see more of a trading history before registering. They do offer a 14 day trial for $14 so you can certainly test this software before paying a monthly charge of $97 to see if they truly hit the 72.5% accuracy rate they promise. If you have tested this signal service already or you are current member I would love to hear your thoughts and experiences about this service. Please leave a comment under this article now and start a discussion that will benefit the rest of the binary options community. Summary: Is BOPO a worthwhile service in 2018? Read the updated review to find out.